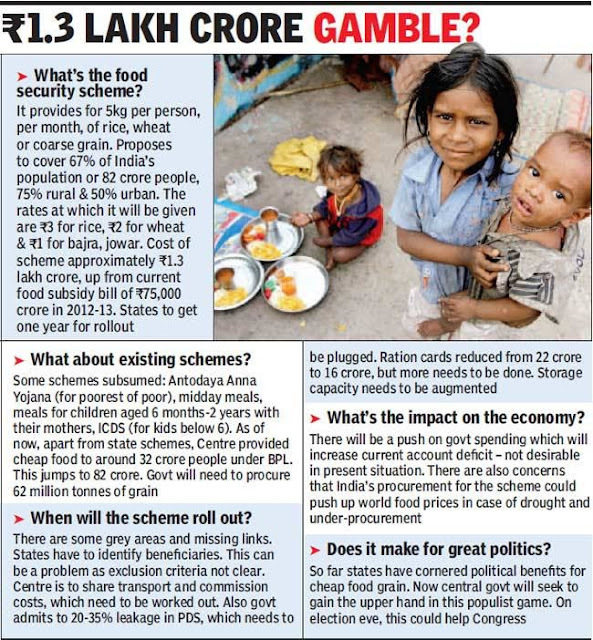 Food Security Bill - Good or Bad for India ? Food Security Bill was passed by Parliament yesterday. Food Security Bill provides 5 kg of Cereals to each person covering 67% of India's population. Cereals can be Rice, Wheat, bajara, and jowar. It can be any of these. Rate at which this will be provided is Rs 3 for Rice, Rs 2 for Wheat, Rs 1 for bajara and jowar. Central Govt will be burdened by Rs 1.3 Lakh Crore. (100 Lakh = 1 Crore. 10 Lakhs = 1 Million.) Management of food grain (procurement, distribution and arrangement of food grains at this level) will be another kind of work. The food security bill does not look bad in itself. India is still poor and to make better India, we need healthier children. Disparity among families are still high. Wealth distribution is not equal nor it is any convincing for large population of India. It means, whatever we have done all along after independence is not enough. Govt plans to cover 67% of people under food security. It means 67% of people are at such state that they cannot feed themselves even at minimum level. In this case, and after seeing ourselves after long journey after independence, we know that we cannot do much better in recent years as well (Corruption, policy makers ineffectiveness, policy paralysis etc will always haunts us). Directly covering those from the bottom of the poorer make some promise about the development. At least they can ensure some energy for themselves and feel secured. Security will bread confidence in state and they will be in better position to plan their future. Healthier people will be less prone to terrorism and violence against society. They will become more tough to lure by anti social elements. But then why people are opposing Food Security Bill? I oppose such move as these kind moves makes selection of Govt difficult on the basis of resource management, leadership, policy making, foreign policy and others. It even guard against high level of corruption. Ask why? Majority of votes will comes just for direct benefits to poor people and illiterates. They cannot think about corruption in coal mines allocation, bandwidth allocation (2G scam) etc. The burden will be larger with time as it will be almost impossible to increase the rate at which govt gives cereals due to impact on election but cereals price will rise. It means burden will rise. It became very easy to keep majority poorer and distribute few Roti(bread) to them from tax payers money. Majority votes make winning possible. This can lead India to darkness! Hope for better Society in India. Hope better politicians got selected that lead to better and powerful India that can stand against outside forces.